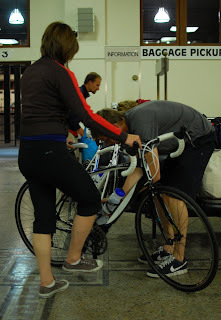 These hardy souls arrived on the Friday evening train from Portland, and are pictured in Seattle's King St Station assembling their bikes. They were planning on riding the Seattle to Portland Bicycle Classic 2010, a 200-mile two day ride. Around 10,000 riders take part each year. I've yet to participate.